Loren Williams currently resides with his wife Heather, daughter Mickayla, and son Ryan in Westvale, NY where he is a prominent and respected full-time fly-fishing guide and guest speaker specializing in salmon and steelhead tactics and teaching top-level trout fishing skills. You can learn more from his website www.flyguysoutfitting.com. Loren was born and raised in northeastern Pennsylvania, where he was the youngest of three boys. His childhood memories focus largely on family events and time spent in the outdoors. After high school, Loren attended and graduated from The Pennsylvania State University with a Bachelor’s of Science degree in Wildlife and Fisheries Science. Throughout his life, Loren was exposed to, and developed a passion for, all things outdoors. Very prominent in his young years were times spent with dad chasing the breathtaking beauty of the native eastern brook trout. Most likely, these adventures spawned Loren’s current passion for coldwater fly-fishing. Not long after his first bait-caught trout, Loren began to dabble with tying flies and fishing them; first for small pond panfish, then the logical progression to his beloved trout. By age 10 Loren could tie a decent fly and cast it well enough to catch fish. In addition to the guiding career he so loves, Loren is a long-standing member of Fly-Fishing Team USA and the current head coach of the US Youth Fly-Fishing team. 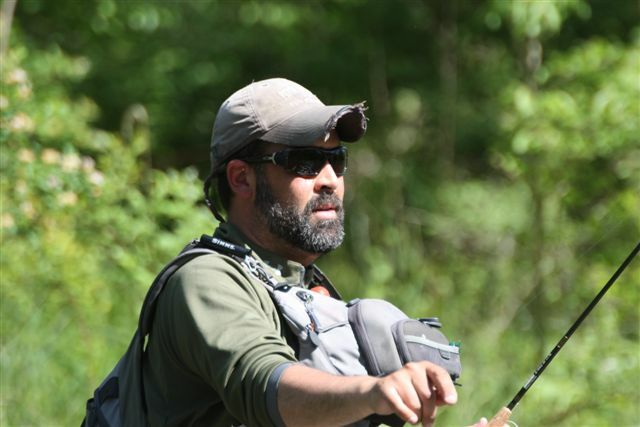 Loren’s interest in FIPS-Mouche governed competitive fly-fishing started in the summer of 2005 when he was selected to represent the USA as Fly Fishing Team USA’s first official fly tier. That year he accompanied the team to the 2005 FIPS-Mouche World Fly-Fishing Championships in Lycksele, Sweden-his first exposure to competition fly-fishing. Ever since that event, due to the positive experience in Sweden, the teammates he met, and the knowledge he gained, Loren has dedicated every moment of his free time to learning the nuances of competitive fly-fishing. Not only has this rekindled his passion for the sport, he has become a better angler and, therefore, a better teacher.